Bill Oakes - For the Northwest Herald Teacher Anna Carroll takes a picture for soon-to-be Crystal Lake South High School graduate Kelsi Gold, with her English teacher Scott Busan. Gold was one of the students participating in the graduation ceremonies at South High School on Saturday morning. 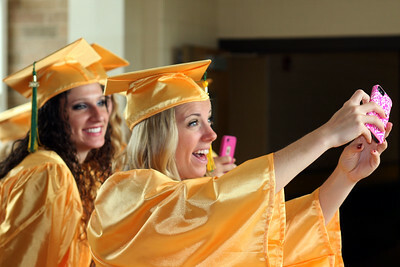 Bill Oakes - For the Northwest Herald Carly Nolan prepares for a selfie as her friend Lauren Gauger smiles in the background as the two were waiting to walk into the graduation ceremonies at Crystal Lake South High School on Saturday morning. Bill Oakes - For the Northwest Herald Kelsey Harenza takes photos for her friends Lauren Gauger, left, and Carly Nolan, right, with their guidance counselor Kyle McCaughn. 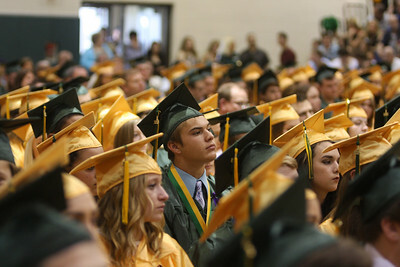 The soon-to-be graduates participated in the Crystal Lake South High school ceremony on Saturday morning at the school. Bill Oakes - For the Northwest Herald Crystal Lake South High School seniors parade past the "pit" in the high school's lobby on their way to becoming graduates at Saturday morning's ceremony. 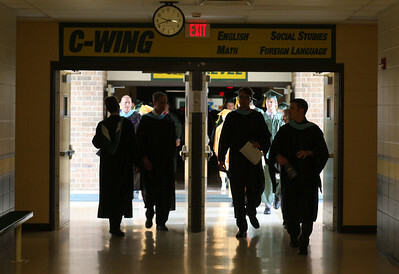 Bill Oakes - For the Northwest Herald Crystal Lake South High School teachers and administrators lead students through the darkened halls of the school on their way to graduation ceremonies in the school's gym. Just minutes before ceremonies were to begin the entire neighborhood suffered a power outage, leaving the school without primary power for the event. Soon after the ceremony began power was restored by Commonwealth Edison for the area. 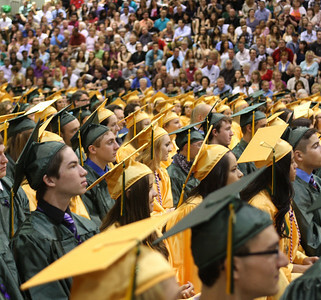 Bill Oakes - For the Northwest Herald Family and friends of graduating students from Crystal Lake South High School had to start the ceremony without power due to an outage affecting more than 800 homes in the area. Power was returned to the building soon after the event began. 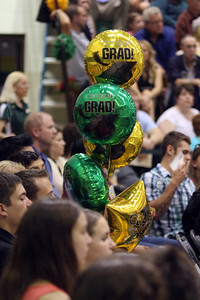 Bill Oakes - For the Northwest Herald A full gym and a lack of air conditioning early in the ceremonies left family and friends of the graduating class at Crystal Lake South High School using their programs for fans until power was returned to the gymnasium. Just minute before the ceremony power for the school and surrounding houses was lost for approximately 30 minutes. 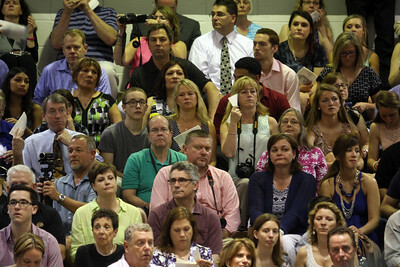 Bill Oakes - For the Northwest Herald A sea of caps and gowns filled the Crystal Lake South High School gym for the 2015 graduation ceremonies on Saturday morning. 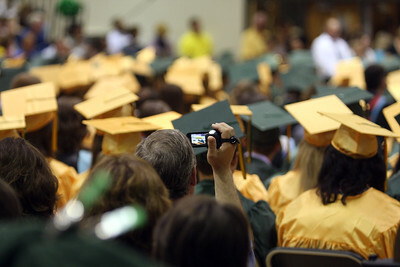 Bill Oakes - For the Northwest Herald Video cameras and phones caught the action at the 2015 Crystal Lake South High School graduation ceremonies on Saturday morning. 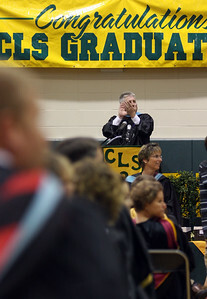 Bill Oakes - For the Northwest Herald Crystal Lake South High School principal Scott H. Shepard acknowledges the efforts of the parents of the students at South's 2015 graduation ceremonies on Saturday morning. Bill Oakes - For the Northwest Herald Balloons stand ready for the celebrations after the Crystal Lake South High School graduation ceremonies on Saturday morning. 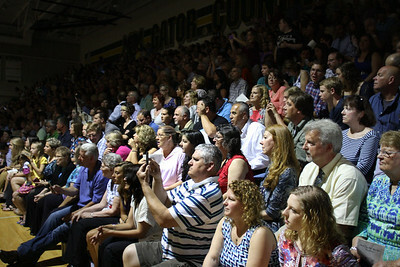 A full gym and a lack of air conditioning early in the ceremonies left family and friends of the graduating class at Crystal Lake South High School using their programs for fans until power was returned to the gymnasium. Just minute before the ceremony power for the school and surrounding houses was lost for approximately 30 minutes.